Do you often take part in conferences or other public meetings and use your laptop there? Or probably you like working at night when everybody at home is sleeping? Or maybe you need to stay in libraries, attend lectures and have your laptop working there? You can just turn off the sound on your laptop before closing it. But I bet you will forget about this 9 times from 10. You can change sound scheme in your operating system settings and disable annoying sounds. Do you know how to do this? It will take some time to find all needed events and turn them off. And what if you need to turn these sounds on again? Not a good solution to edit the sound scheme each time you need to switch sounds. You can just download and run a simple application that mutes your laptop on logoff and keeps it quiet on logon. Auto Mute software does exactly what you need! Let's expand the situation further. A lot of applications are started automatically when you turn the laptop on. And definitely some of them (Skype, ICQ, other instant messengers) produce sounds on start. So if you wish your system to start quietly, you would need to turn off sounds or change sound schemes for all applications of this kind. And the first thing to do after installing a new application will be turning its sounds off. Not a convenient solution. 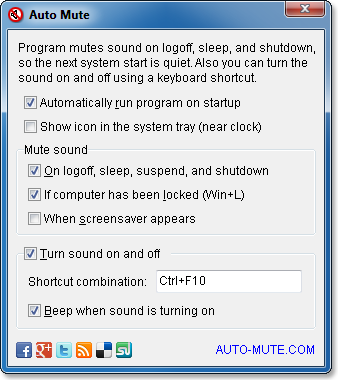 Auto Mute solves this problem by keeping your laptop quiet until you manually enable its sound using some keyboard shortcut or by double clicking Auto Mute icon in the system tray. Even if you work in office and your colleagues have accustomed to sounds produced by your laptop, sometimes it is needed to mute it. Imagine that you've stepped away from your computer; screen saver started working and locked your laptop from access. And then completely out of the blue some application starts playing sounds - Skype is calling, system or virus monitor is producing alerts, etc. Does anybody in your office know how to mute your particular laptop? Probably no. Auto Mute will mute your laptop automatically when a screen saver starts, so it won't annoy your colleagues when you are away. You don't need to pay anything to use Auto Mute software, it is free. You can download it right now!